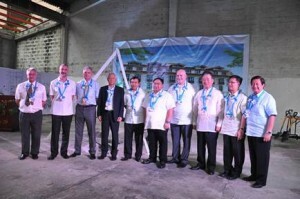 In line with its mission of serving its growing membership better, AMOSUP officially launched the new Sailor’s Home in Manila through a formal groundbreaking ceremony last Nov. 29, 2011. The event was graced by Administrator Jose Capistrano, Jr. of the Intramuros Administration, the Union’s social partners and friends from government and private sector as well as representatives of different shipowner companies, manning agencies and allied industries. The newest Sailor’s Home will soon rise along Cabildo Street in Intramuros next to the Seamen’s Center. When completed, it will have a 377-bunk bed facility capable of accommodating double the capacity of the existing Sailor’s Home in Manila. The building will have five levels with basement parking and an attic dedicated to the separate sleeping quarters of women. The ground level will be a mixed-use floor with business offices so that stay-in members can have their documents processed without leaving the building. Taking into account the recreational needs of its members, the new Sailor’s Home will feature a gym and a study hall. It will also take advantage of the latest in green technology with improved illumination and ventilation to maximize comfort while reducing energy wastage. 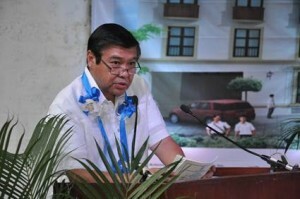 Administrator Jose Capistrano of the Intramuros Administration delivered a short speech during the short program that followed the groundbreaking ceremony of the edifice which will become a welcome addition to the walled city. Officers of the Union along with representatives of different shipowner companies, manning agencies and the maritime industry joined hands in putting the time capsule containing the day’s newspaper, a button dedicated to Capt. Gregorio Oca, a St. Benedict medal and other items into place. 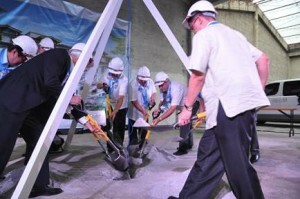 Representatives from the international maritime industries, shipowner companies and manning agencies graced the groundbreaking event. From left to right Ian Berry, Chairman, IMTT, Giles Heimann, Secretary General, IMEC, Ian Sherwood, Member, Executive Committee, IMEC, Tsutomu Iizuka, Chairman, IMMAJ, Jose A. Capistrano, Jr., Administrator, IA, Dr. Conrado F. Oca, President, AMOSUP – PTGWO – ITF, Stephen Cotton, Maritime Coordinator, ITF, Yoji Fujisawa, President, AJSU, Usec. Hans Leo J. Cacdac, Administrator, POEA, Mr. Ericson M. Marquez, President, Virjen Shipping Corporation.